Elevation Gain: 4,680 ft. (total), 10,080 ft. max elevation at Camp Muir, starting @ Paradise 5,400 ft.
On this September day, it was warm. We hiked almost the whole time in short sleeves, except when we sat down for lunch. We didn’t hit snow until something like 8,000 feet and even then, if you wanted, you could stay off the snow for a bit longer. However, we found it was actually easier to just get on the snow and start walking rather than avoid it. We used trekking poles and KAHTOOLA MICRO spikes that were more than adequate for this hike on this day. These micro spikes were easy to pull on and off and much better than walking without them. We started early and saw almost nobody going up (preferable). On the way down we saw a boatload of people heading up. 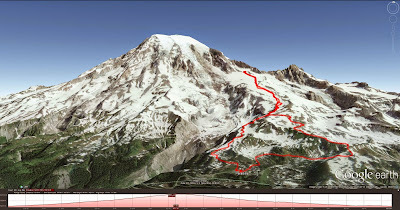 The analogy of a line of ants going to a sugar bowl (Camp Muir) would not be out of place. The snow was much more slushy on our way down, which is okay for going down but perhaps isn’t fun when climbing up. There was just one “tricky” spot in the snowfield (near the top) that was icy with small (very narrow) “crevasses”. There were flags to warn you and paths over the crevasses were obvious. Still, don’t take them lightly. Yes, we brought trash bags to slide down (glissade) and we did. Bring heavy duty bags. Better yet, bring waterproof pants, slip them on, and just go down like that. Most people on the way up just stared at us with blank faces as we slid past them. We weren’t sure if they were annoyed or wishing they had an earlier start. I was expecting Camp Muir to be more extensive, with more places to sit and take in the view. That really isn’t the case, it’s just a dry ridge divides the Muir snowfield from the Cowlitz Glacier. Most of the climbers the day we there were sprawled out on the main level of the ridge, which left the upper level for the day hikers. It’s near the bathroom where you’ll catch a whiff or two. You can’t explore any more further past the ridge without being tied together – at least that’s what a sign said. While the Muir snowfield seemed free of litter, I was surprised at number of pieces of gum we spotted, especially the bright pink and greens. People: swallow the gum or put it a piece of paper in your pocket. In the Google Earth image of the trail included with this post, it shows that we followed one part of the Skyline Trail up to the turn off to Muir and followed a different part of it back to Paradise. Left: Small Crevasse in Muir Snowfield; Right: One of Many Gum Sightings – People, Really?